Valerie Palmedo-Goudie graduated from Auburn University in 1986 where she earned a Bachelor of Arts Degree. She graduated from Washington and Lee School of Law in 1989 with her Juris Doctor degree. She was admitted to practice in Alabama in 1990. Valerie’s practice in Alabama included the representation of clients addressing everything from drafting simple wills to capital murder. Valerie applied for admission to the Arkansas Bar after learning that her husband, Dr. Anthony Goudie, PhD., was taking a position at UAMS. She joined the Law Firm of Wallace, Martin, Duke and Russell, PLLC, in May of 2013 upon admittance. She continues as a member of the Alabama Bar, as well, opening up opportunities for her clients with business in both states. 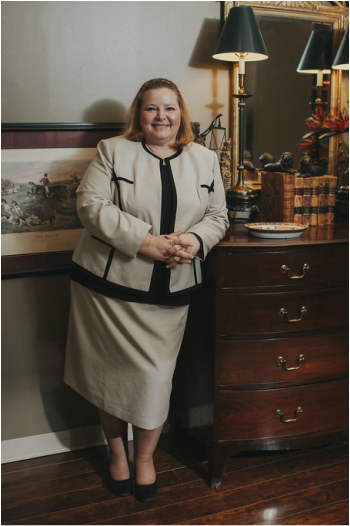 Valerie is the past president of the Calhoun Cleburne (Alabama) Bar Association and a former member of the Alabama Criminal Defense Lawyers’ Association. She is currently a member of the Arkansas State Bar Association and is a member of the Mock Trial Committee for that organization. Valerie was born in Paterson, New Jersey and had the pleasure of living in several states thanks to her father’s career in the U.S. Army. In 1972, he was stationed at Anniston Army Depot, where his family joined him and stayed. Her parents loved the Alabama climate, bought the house her father still lives in today, and proceeded to raise their family. ​Losing her mother to breast cancer made Valerie very aware of the devastating effects of this horrible disease. She actively participates in the American Cancer Association’s Relay for Life, an annual event that raises money for cancer research. She also assists organizations designed to rescue animals from kill shelters and abusive environments. Valerie provides the same legal services in Arkansas that she provided in Alabama. Valerie's fields of practice are: Family Law, Criminal Law, Juvenile Law, Employment Discrimination, Medical Malpractice, Personal Injury, Federal Civil Rights Violations, Corporations, Construction, Products Liability, Probate and Appeals.